Since its inception in 2012, Art Wynwood has become the premier winter destination contemporary and modern art fair in South Florida, and offers the most diverse, affluent and culturally savvy international audience in the United States. 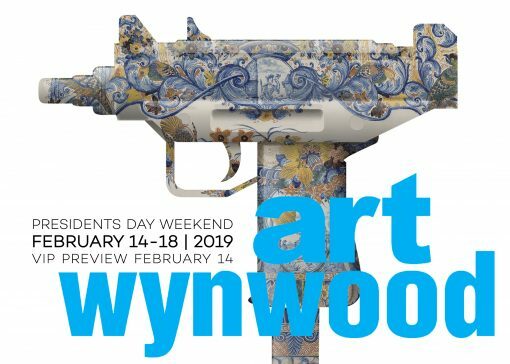 Produced by Art Miami, the Art Wynwood fair will debut its eighth edition during Presidents Day Weekend, February 14 – 18, 2019, at the former Miami Herald site, which also is the new home of Art Miami and CONTEXT Art Miami, and welcomed 85,000 visitors during Miami Art Week 2018. Art Wynwood will open on Thursday, February 14, with an invitation only VIP Private Preview benefiting the Institute of Contemporary Art, Miami (ICA). Nestled between the Venetian Causeway and MacArthur Causeway, and just east of Biscayne Boulevard, Art Wynwood will offer an unprecedented level of convenience located in the heart of the cultural epicentre of Miami. The new downtown location will also offer a renewed connectivity to the Miami Yacht Show, where the “World’s Most Expensive Yachts are on display for acquisition” just a few steps away from the fair.